Optimising blade maintenance and a reduction of the levelised cost of energy (LCOE) will be the core focus of a new research programme launched by two universities and host of companies from across the supply chain. The Cortir project — cost and risk tool for interim and preventive repair — started this month (January 2019) and will last for two years. Companies and research institutions involved aim to develop a tool capable of analysing blade and composite behaviour to determine a technical and financially sound operations and maintenance (O&M) strategy. They also hope to use theoretical and experimental work to demonstrate how blade retrofits can be deployed to reduce LCOE by "diverting from standard repair solutions", the companies added. The Danish government’s energy technology development and demonstration program (EUDP) will provide 51% of the project’s DKK 28.8 million (€3.85 million) total funding. Research institutions working on the Cortir project include Aalborg University’s civil engineering department and the Technical University of Denmark’s (DTU’s) mechanical engineering department. Energy companies E.on, Hofor, Engie, Acciona, Ørsted, Equinor, Enel, Arise, Innogy, Falck Renewable subsidiary Vector Cuatro, Ewii, and EDF are also either participating and sponsoring the project. 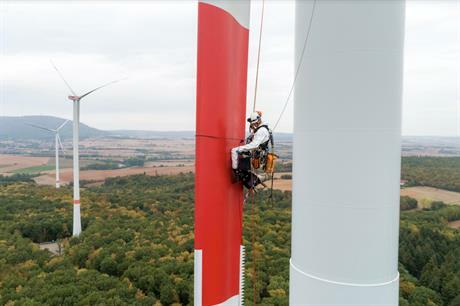 Turbine manufacturers Nordex and Vestas, plus blade maker LM Wind Power will also take part. Service company Global Wind Services, insurance firm Codan, market analyst Guide2Defect, and research and development (R&D) consultancies Kirt x Thomsen and ECC are involved too. Danish blade technology company Bladena is the project manager. Windpower Monthly presents its annual Blade O&M 2019 Forum in Amsterdam (12-14 March). This popular networking event will provide the latest insights in trends, technology and research in blade maintenance and life extension. To find out more about the speakers at the event, and to book tickets, click here.